Hyundai has launched the updated 2017 Creta SUV in India. The updated Creta SUV now gets cosmetic as well equipment upgrade to it. Apart from getting exterior as well as interior update, Hyundai who also happens to India’s second largest car manufacturer has decided to add an exclusive diesel trim in the form of a new Executive variant ‘E+ trim while there is one more trim in the form of SX+ which gets dual tone trim to it. Unfortunately, Hyundai has decided not to make any changes under the hood and thus this popular SUV still offered with 1.6-litre Dual VTVT petrol, 1.6 Litre CRDi VGT diesel unit and 1.4L CRDI U2 diesel engine options. There is nothing bulbous on the side profile of the Creta, which makes it carry the butch SUV stance from this angle as well. The squarish roofline, sharp and rising crease lines, roof rails, high ground clearance and pronounced wheel arches with black cladding are undoubtedly the ingredients of a full-flavoured SUV. The 5-spoke diamond-cut alloys further add a pinch of premium appearance to the Creta. The sharp shoulder line goes up to the tail lights that carry the crease to the tailgate in a wave pattern making a smart number plate housing, nice touch. With a silver skid plate and dual tone bumper, the Creta looks complete from the rear. There will be no change in the interior design of the Hyundai Creta 2017. It will continue with the same interior theme. It will however, get new materials. The colour theme will be a new one with black and red theme on certain variants. The upholstery also will be upgraded. The interiors which are already good will be further enhanced. This will make the SUV feel even more premium. Rest of the interiors will be the same. There shall be Apple CarPlay and Android Auto as well on offering with the new Arkamys Sound Mood system. There are no changes in the seating and space. So, the Creta will continue to have the same space like the current one. Five people can sit comfortably abreast without any constraint for knee room or head room. There is even a rear AC vent that will cool the rear occupants area quicker. The Hyundai Creta 2017 will see some more features getting added to it. A new infotainment system with Apple CarPlay and Android Auto is likely to come. This is the same system we had witnessed in the new Elantra. Hyundai is looking at adding more options on the SUV as and when time passes by. It even has Arkamys Sound Mood system, which comes standard on the S+, SX+, SX+ Dual Tone & SX(O) variants. Then on the inside, the seats now have a black and red upholstery too. Hyundai’s SUV is powered by a set of engines shared with the Verna – 1.4 and 1.6 diesels and a 1.6 petrol, all of which get a six-speed manual gearbox as standard, though the bigger diesel gets the option of a six-speed auto as well. We managed to drive both the 1.6-litre motors – petrol and diesel – and came away quite impressed. The 1.6-litre diesel engine is smooth, silent and feels very punchy in its band of operation. While its high power output of 126bhp is important, even more important is the healthy torque figure of 26.5kgm; the latter helping with the additional weight of the SUV. There is a fair bit of turbo lag initially and the engine hits its stride only after 1,700rpm, so you do sometimes find yourself needing to shift to a lower gear at times in traffic. Performance after that, however, is strong and overtaking is just a flex of the right foot away. And the Creta is also well-suited to highway use, the punchy midrange and tall gearing working well on open highway roads to deliver plenty of useable performance. So what you want to do with the diesel is stay in the 2,000 to 4,000rpm powerband. What remains a strength of this motor, however, is refinement – it’s smooth and silent at just about any RPM, and even the clutch action is super light. The Hyundai Creta with its 17-inch wheels rides like a car twice its price…maybe even better. There is an almost minimal amount of pitching or bounce on large bumps and the Creta even take broken tarmac with relative ease. Of course, chucking it into a corner at higher speeds does take its toll on the overall composure of the car, but more on that a little later.Every Hyundai car in recent times has differentiated itself by being easy to drive. Whether that means a light steering, light clutch or light gearshifts, most Hyundai’s do not tend to give you general fatigue either in the city or on the highway. And the Creta is exactly the same. Being quite a bit larger than the i20, etc, the Creta does not feel large both because of its easy to drive controls and also due to the fact that the large greenhouse offers almost unrestricted views of your surroundings. Of course, having height adjustable steering and a height adjustable driver’s seat also helps. Being a high riding SUV, one might expected the Creta to handle like a marshmallow. It does not. It isn’t exactly a race car, but Hyundai has clearly worked a lot on the overall suspension settings to tune the Creta’s handling dynamics to suit the general public. Although it does have a fair bit of body roll in long sweeping faster corners, the Creta does feel quite comfortable at highway cruising speeds. Yes, there are other SUVs like the Duster that would outhandle the Creta but as an overall package and especially in the city, The Creta is certainly a more livable package.Coming to the brakes, this is possibly one of the only aspects of the Creta that did disappoint us a little. Its not that the brakes aren’t good enough to stop the car in time, it is just the fact that the pedal does not have any solid feel and feedback to inspire confidence from the get go. Maybe the Creta’s brakes just need getting used to but on a personal level, it definitely needs a bit more bite. In the Creta, ABS is offered as a standard across all variants. The Creta is a great option for someone looking for a safe car. 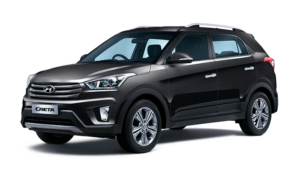 The top end SX(O) variant is offered with 6 airbags, traction control, Electronic stability program and hill-start assist.The Creta is constructed using advanced high-strength steel and ultra high-strength steel. This keeps the weight low as well as enhances passenger protection in case of a collision. This claim was proved when the Creta (Called the ix25 in China) underwent the C-NCAP (China New Car Assessment Program) and scored a full 5 stars. Point to be noted is that the tests were conducted on the mid-range (S+) variant without curtain airbags. Hyundai has come up with a smart offering in the compact segment, Creta, which is refreshingly styled. Its outer stance is robust, which makes the SUV look larger than the rivals. Hyundai’s new generation Fluidic Design language convincingly manages to lure lookers. Cabin is designed austerely. Space for passengers on the front and rear is generous, however, the view from rear is a little restricted due to the high window line that makes the seat seem low. The well-equipped cabin and all-essential safety features make Creta a desirable SUV. The powerful engine line-up and a segment-first six-speed auto box on offer (SX+ diesel only) bring Creta a notch above the rivals. Mileage is appreciative and performance on road is good, making Creta a complete package.